By targeting the aging process at the cellular level, the Alterna Caviar styling products help address natural, chemical and environmental aging by infusing hair with the latest age defying technologies to restore hydration, strength, vibrancy and elasticity. Minimize the visible signs of aging with this ultra dry, flexible hold hair spray that provides long lasting style support. Infused with caviar, a rich source of omega-3 fatty acids, and nutrient activating enzymes to help maintain vital moisture levels in the hair cuticle while active organic compounds, known as plant cytokines, help stimulate protein production. Alterna's age control complex provides an instant dose of vibrancy, enhancing the strength, elasticity and vitality of the hair. Provides a flexible, yet brush-able hold while adding fullness and shine. Provides a light touchable hold. May be layered to achieve a stronger hold- the more you use, the firmer the hold. To mold: spray on to wet hair and shape with fingers, use with or without heat. To smooth: spray on to wet hair and smooth with brush while styling. Re apply for maximum hold. 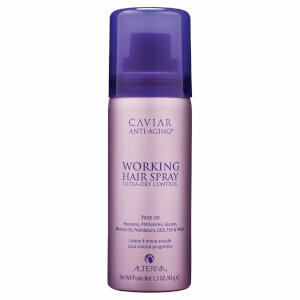 To finish: spray evenly over hair after styling. Re apply for maximum hold. SD Alcohol 40-B, Hydrofluorocarbon 152a, Octylacrylamide/Acrylates/Butylaminoethyl Methacrylate Copolymer, Cyclomethicone, Aminomethyl Propanol, Phenyl Trimethicone, Triethyl Citrate, PEG/PPG-17/18 Dimethicone, Pentaerythrityl Tetracaprylate/Tetracaprate, Panthenol, PPG-5 Ceteth-20, PPG-2 Myristyl Ether Propionate, Propylene Glycol, Caviar Extract, Aqua/Water/EAU, Hydrolyzed Soy Protein, Glycine Max (Soybean) Symbrosome Lysate, Fennel (Foeniculum Vulgare) Extract, Pikea Robusta Extract, Saccharomyces(Lysate,Copper,Zinc )Ferment, Superoxide Dismutase, Lactoferrin, Adenosine Triphosphate, Retinyl Palmitate Polypeptide, Niacinnamide Polypeptide, Ascorbic Acid Polypeptide, Pantothenic Acid Polypeptide, Phospholipids, Corn Oligosaccharides, Copper Oxidase, Acetyl Methionine,, Acetyl Serine, Amino Acyl tRNA Synthtase, Magnesium Sulfate, Peptone, Fragrance/Parfum. Will NEVER purchase another hairspray! Getting older w/very fine, lifeless hair..as well as starting to lose more of it. The whole Alterna line has given me improved body, volume & hair I always dreamed of..you cannot go wrong!! I LOVE this hairspray because it provides great flexible hold while protecting against the frizzies caused by humidity---with no "helmet feel" at all. My only complaint is that the large size can, which is by far the best value, is very heavy when full, and has a pretty good size circumference----so it's hard to hang on to while trying to press the spray nozzle at the same time with one hand! It's pricey , but worth it to me----and it does last a long, long time. It's way too big for travel, especially by air. This is the first time I have purchased this product and I will be purchasing it again in the future. The can is much larger than I expected, and the spray goes a long way. Humidity does not affect its holding power. I am able to style my hair in the morning, and then re-style again in the evening, if necessary, and have no problems with stiffness. Try it for yourself and you will be very pleased!